Guess who is taking off to Houston before the week ends? These two. Together! I couldn't have picked a better pair myself. They really do compliment each other, don't they? I'm not sure if they were purchased with the intention of being forever pals, but I'd like to think so. Bonsai reminds me of an old tree that resides deep in the woods, hence his name. 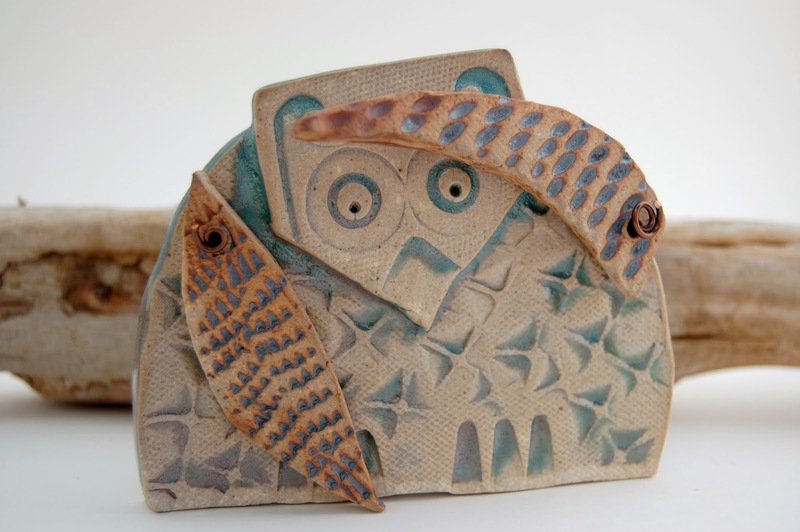 I don't know why Maurice ended up with that name, but I love how the use of zippers translated into the clay, mixed with the black stain and translucent green glaze. 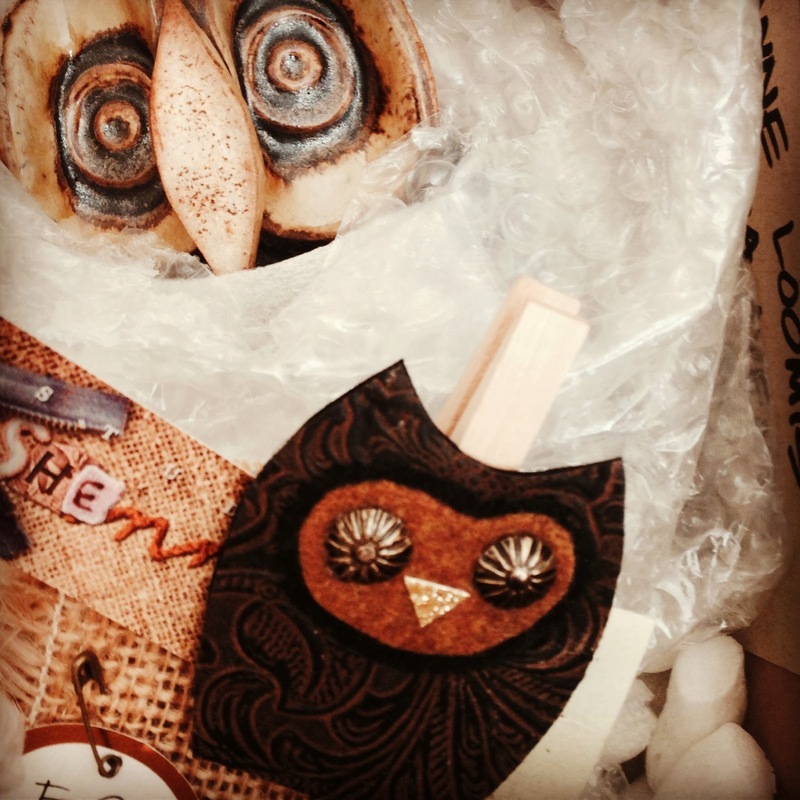 And Sunday I get to start making more owls! Bentley was a commission that grew out of a listing photo. 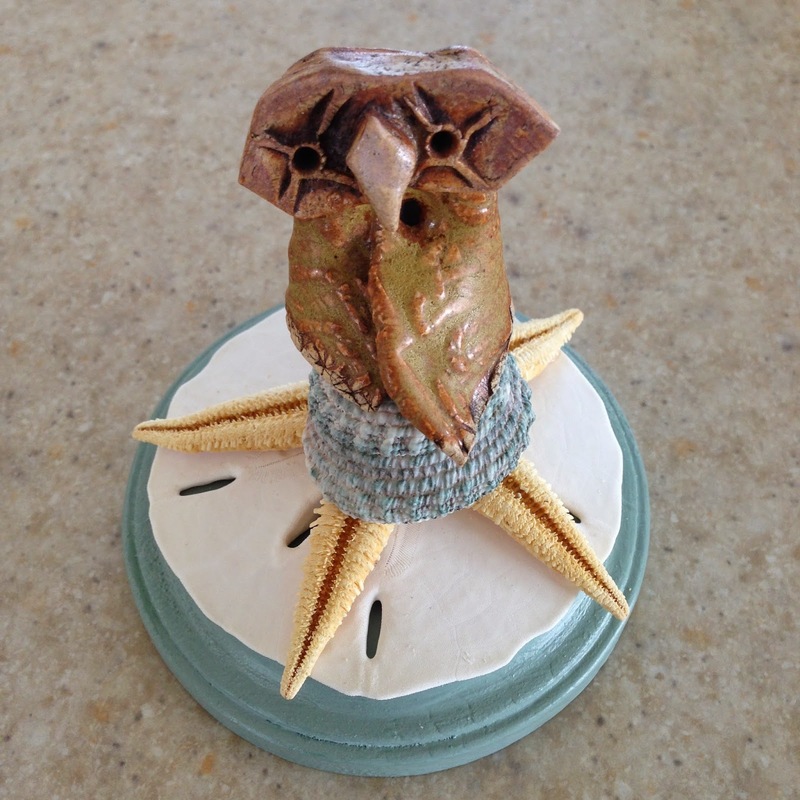 I had lots of old starfish & shells from my life on Cape Cod (and an L.L. Bean coastal Christmas wreath from my parents) and decided to have fun balancing Bentley upon a conical shell, which, in turn was balanced upon a starfish. 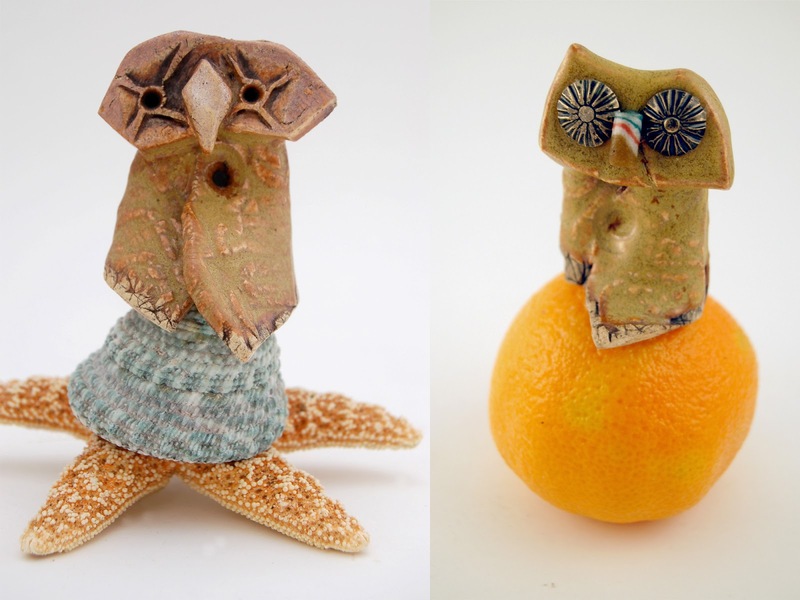 Other mini owls had been photographed balancing on mandarin oranges. It keeps things interesting for me. Bentley's listing photo (left) that inspired the above totem, Ochre (right), gifted to an undoubtedly deserving teacher. Bentley will be staying in Colorado, gifted to a mother of a friend, a lover of beaches and owls. Until the next firing, friends. I can hardly wait! The workshop was great. Not one that I'm a stranger to (which makes me even more awful - I've taken one before). Vision boards. And mine was all about wanting peace. HA! Good Gawd. Who am I kidding? And left over on my old vision board was Etsy. When I made that vision board, I hadn't posted anything in my shop. Well, I posted stuff. But at the workshop yesterday, I casually mentioned to some of the other participants that I wanted my Etsy shop to be my job. 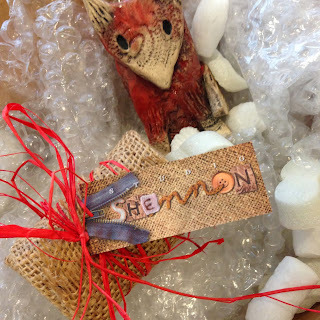 "Shennon, Etsy needs to be on your board then - BIG." And later that night, while watching our favorite comedy on t.v., my husband and I heard that Etsy app "ca-ching!" Which was followed by high fives all around. But not before I received the beautiful forgiveness of my darling daughter (who is now home sick from school today). popped a few tags today... and I only needed SEVEN dollars in my pocket! 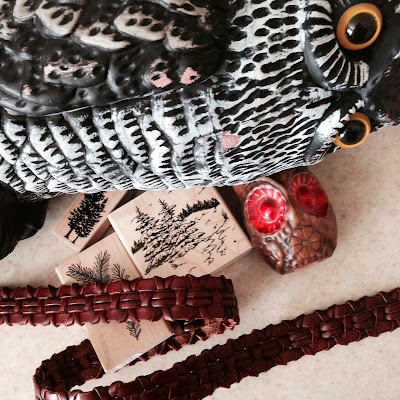 a beak-less (I can fix that), outdoor owl that will next Halloween roost on my porch among the rats, a wooden owl pepper shaker with lovely red orange eyes, some botanically themed rubber stamps and leather belt for imprinting clay. Like I said, this is... awesome. I'm always reluctant to say goodbye to little Templeton and Scabbers come November. 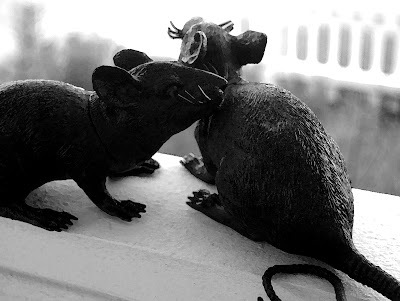 I have seven of these squeaky Dollar Store rats and I really feel the need for more, dozens to be truthful. 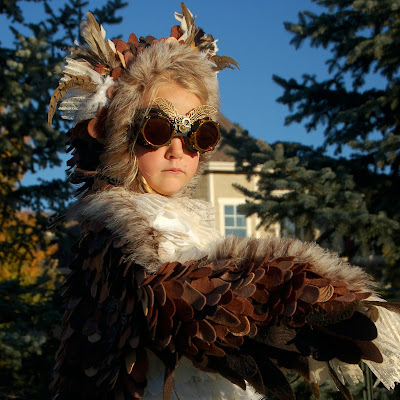 So, it seems apropos to post about the steampunk owl costume I made for my eldest daughter now, nearly a week after Halloween has passed. You could say that I over achieved, just a little bit, but I was so incredibly inspired with the subject matter! 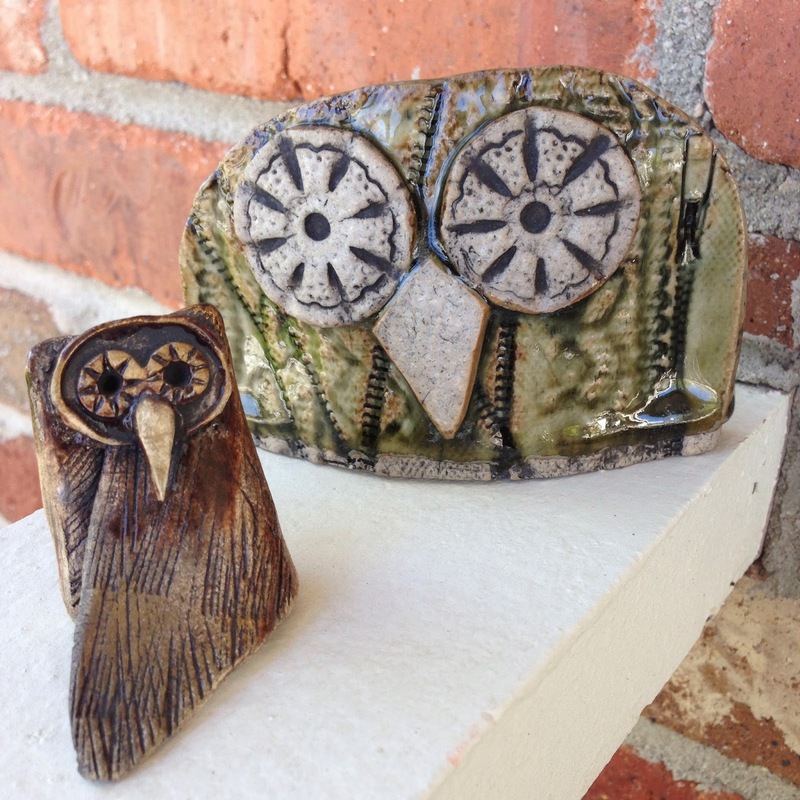 I have been, after all, referred to as "the owl lady" at the ceramics studio for several years. It was undoubtedly a whole lot of work, but my recipient was thrilled, her younger sister wants to be the owl next year, and it was a true joy to see that big ol' great horned owl excitedly flapping her wings and circling the park across the street from our house in leaps and bounds. adieu, bon voyage "Little Red"
Here they are. 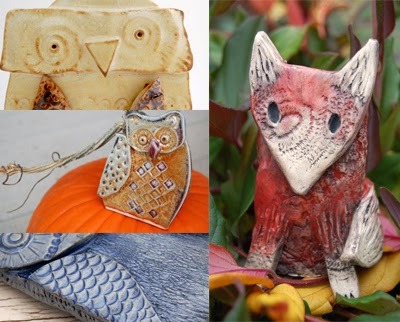 My first 4 listings on etsy. My intention is to post at least two per day until all my inventory is online. That is my intention. I will do my best to see that that actually happens. So far, so good. I have received so much encouragement and support and for that I am truly grateful. Thank you! I'm a printmaker by trade, but a lover of all art and craft mediums. Texture and pattern play an important role in all of my pieces. I am currently working in clay.